The Ankarana National Park is one of the most visited sites of the North of Madagascar. It derives its fame from its Tsingy, its rich biodiversity, and its ancestral traditions..
Several million years ago, giant corals formed this limestone mass with fine, hard grains which, under the action of rain loaded with marine salts, will erode over time and give these pointed forms And sharpened, the karsts. This massif is pierced by hundreds of miles of galleries, caves and canyons, with cliffs more than 660 ft. It is the place of predilection of Jean Radofilao, a great speleologist who brought his invaluable contribution to the knowledge of the underground world of Ankarana. The volcanic eruptions of the massif of Amber situated in the North will cover these karts with basaltic effusions. On this rich soil, a particular vegetation will be able to settle with its baobabs, ficus, Adenia .... 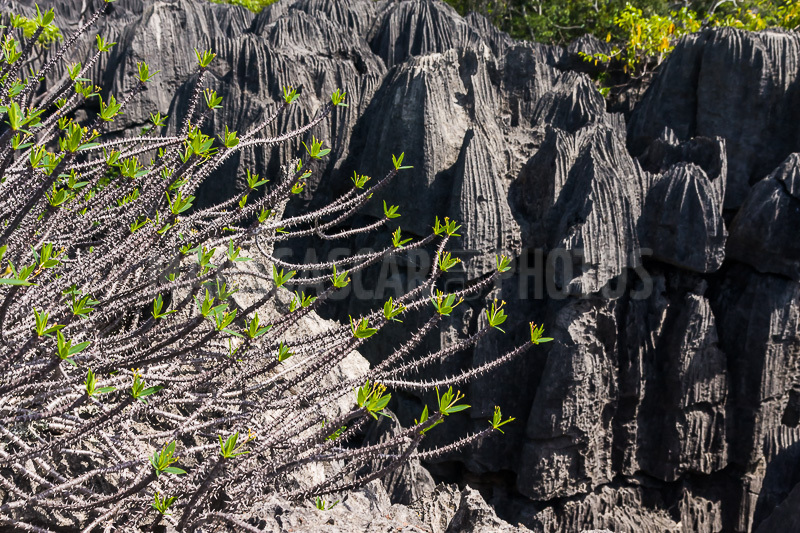 Between the limestone soil and the volcanic soil will live dry forests and other evergreen. In this fortress of stones and this tangle of vegetation, a unique fauna will flourish with a high rate of endemism, which will remain almost unknown until the twentieth century. It was J. De Saint-Ours, in the fifties, who carried out the first explorations. In caves and rivers there are high concentrations of bats, shrimps and freshwater fish, but also Nile crocodiles. The diurnal and nocturnal lemurs inhabit the forests. The carnivorous fosa rub shoulders with reptiles such as uroplates, chameleons, brookesias, gecko, who use mimicry to hide from their predators. The Brush Pickle, recently introduced from Africa, has become a regular at the Park. It is said that at first a population lived in the caves, feeding on picking and hunting. Waves of immigrants from Mozambique, Comoros, Zanzibar and the Persian Gulf landed on the silvavy soil of the Mahavavy. It was they who, by dint of walk over the Massif, would have given it the name of Tsingy, which literally means "walking on tiptoe." The Kingdom of Ankarana was founded in 1697, with the advent of its first king Andriantsirotso. Until today, the us, beliefs and rituals are preserved to name only the Tsangatsaina, the Tsakafara, and the reincarnation of the dead. The king of the Antakarana still lives in the royal residence of Ambatoharana, and is the pillar of this ethnic group proud of its rich past.